Crack Open A Cold Powerglide Road Soda, Buddy! Filed to: Time For An Oil Change!Filed to: Time For An Oil Change! Some Xeroxing, cutting, and glue-stick work followed, and we had our own somewhat non-poisonous-looking brands. I made some Infected Weasel Bladder Porter, which lacked marketing appeal but featured a really cool weasel logo, followed by Shame Beer and Spiro Agnew Stout. 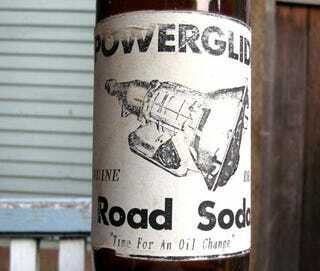 My favorite, however, was good ol' Powerglide Road Soda Genuine Draft (the "Road Soda" part came from the cop who taught at a traffic school I'd attended in penance for a speeding ticket; he referred to drunk drivers as having "had a few too many road sodas" and the phrase hardwired itself into my brain). The inspiration for the beer's name came from the Powerglide that sat on the floor of our "brewery" in a slowly spreading puddle of Dexron; I had swapped a TH350 into my Impala and was trying to find someone who would give me money for a perfectly good Slip-N-Slide (eventually I got a Quadrajet and an OD-1 distortion pedal for it). I'd thought all the PRS bottles were long gone, but look what showed up in a long-forgotten box!